“I have no idea what to say about this salad,” I said. I’m speaking to myself, the way I often do when I’m working. “You could say, ‘I love Aaron,'” says my darling husband across the dinning room table from me. This is why I write the posts here and he doesn’t. I could say that I pulled this together after a weekend where I way overindulged (like, college level overindulged) in drink (wine glass full of bourbon) and food (6-meat breakfast pizza to counteract that bourbon) and wanted to pull some nutrients back into my body. And I would be mistaken if I didn’t mention that it totally worked, that today I feel like a normal person and not like death. I could say that it’s a beautiful celebration of the seasons, as there’s squash roasted with warm spice nestled with crisp spinach, which is only getting better the colder it gets. And this is true. It’s a fall salad, warming and cozy, healthy without feeling like health food. Or I could lavish extravagant descriptions upon the food. I could mention how the nutty farro contribute a low, earthy note, while the vinegar soaked red onions bring a clean sharpness, all of it firmly steering this squash salad towards savory rather than sweet. I could appeal to clever kitchen hacks by telling you how soaking onions in vinegar will help keep the brightness but tame the sharp bite that can be overwhelm, and then you can efficiently use the vinegar to make a dressing. Or I could defend the use of beans in this salad, because I used to hate when people adding beans to salads willy-nilly. It seemed careless. But now I’ve tried it and it’s the perfect way to add a creamy heft and I’m afraid their may be no going back. But I would absolutely assure you that if beans in salads still weird you out, then feta would be a worthy substitution and would hit many of the same buttons, but you may want to use less salt with the squash. And then I might look back, and realize that I’ve said plenty, and implore you to try this squash salad. I would add a few admonishments, and then wish you the best of luck. Happy Tuesday, everyone. You’ve got this. Preheat the oven to 400 degrees. Toss the squash with two tablespoons of olive oil, a good pinch each of salt, pepper, and flaked red pepper, and the 5 spice powder. Place the squash in a baking dish and roast for half an hour, until tender. In a shallow bowl soak the red onion slices in the white wine vinegar for ten minutes. Put a large pot of water onto boil. Salt the water well, and then add the farro. Cook until tender, about 20 minutes. Drain. 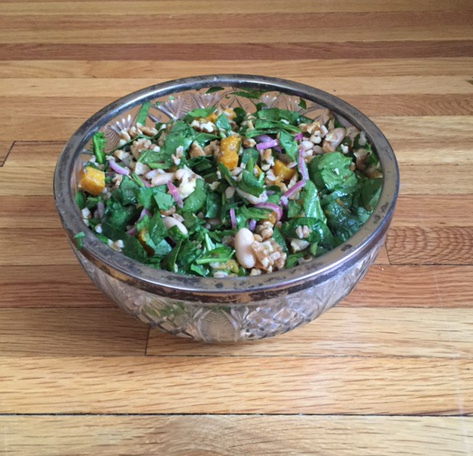 In a large bowl combine the roasted squash, the farro, the onion slices (don’t toss the vinegar), the spinach, and the cannellini beans. Whisk the rest of the olive oil in with the reserved vinegar with a pinch of salt. Taste for seasonings and adjust as necessary. Add to the salad, and toss well. Top with the walnuts. Eat with relish. There are some pretty elemental questions that can tell you a lot about who a person is. Coffee or tea? Milk, dark, or white chocolate? Winter or summer? These are useful tools, the type of question you might ask when you meet someone you like and you’re trying to figure out if there’s friendship potential. And I would argue that one of those questions is chunky or pureed soup. Like any good elemental question meant to determine who you are or aren’t, there’s very few people who only fall into one camp. Additionally, qualifiers are important. You may prefer dark chocolate for eating, but only enjoy milk chocolate brownies, which is a completely different answer than “milk chocolate”. But in asking these questions, you’re actively learning about someone. And sometimes you get to steal good ideas from them. Aaron is a chunky soup person. I’m a smooth soup person. I tend to puree the soups I pull together from roasted veg, and keep the bean heavy soups that we have in heavy rotation chunky. We both have different favs, but we make it work. It just means we eat a lot of soup. And then I heard the idea of pureeing lentil soup. 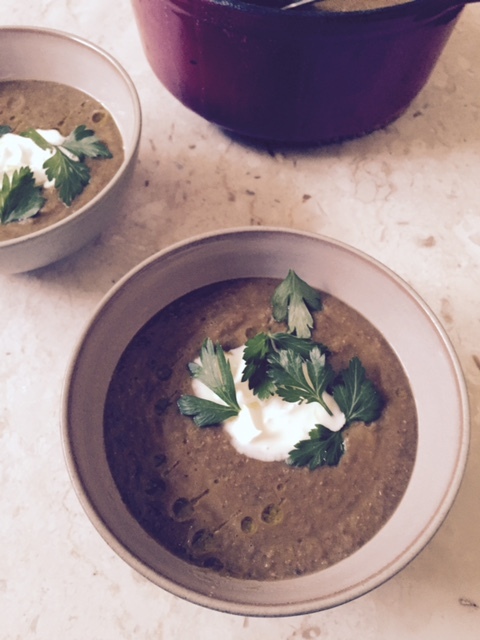 Specifically, I read the idea of pureeing lentil soup from the genius of Dorie Greenspan. It seemed too good to be true- combining one of Aaron’s favorite foods of all time (lentil soup) with my favorite form. And so with my apologies to Aaron, I rushed into the kitchen. It’s a pretty brilliant recipe. After sautéing the vegetables, you throw in lentils, broth, whole spices, and citrus peel. The whole soup gets perfumed, and then pureed. Dorie uses orange or tangerine peel, which I imagine would be fantastic and bring a subtle sweetness to the whole dish. I used lemon instead, because 1) It’s one of five items I always have on hand and 2) I think lemon makes everything it touches better. And then I gilded the lily with the crème fraîche I made last week, which added a beautiful creamy and sour component. If you’re not into gilding the lily you can add a dollop of yogurt. It will still be delicious, I promise. Aaron’s still into chunky soups. I’m still into smooth. But for one meal we had a beautiful compromise. The changes I made to this soup were minimal- I swapped out the garnishes, traded chicken stock for vegetable broth, and substituted orange peel for lemon peel. In order to get a smooth strip of lemon peel without the pith, I make a few swipes with my vegetable peeler. Warm the olive oil in a dutch oven or other large pot over low heat. Add in the onions, celery, celery leaves, and carrots, and toss until glistening. Cover the pot and cook, stirring occasionally, until the vegetables soften but do not take on color. This should take about 10 minutes. Add the broth, lentils, lemon peel, spices, and ginger and bring the pot to a boil. Lower the heat to a simmer, cover, and cook gently, stirring occasionally, until the lentils are soft enough to be smashed. This took me just over an hour, but will depend on how fresh your lentils are. Season with salt and pepper to taste about 45 minutes into the simmering- I add half a teaspoon of salt, but adjust as you see fit. Once the lentils are soft, puree either in a blender or an immersion blender. At this state it will be a more rustic puree. If you want an absolutely smooth soup, you may want to push the pureed soup through a strainer. Adjust for seasonings. Serve the soup with a dollop of crème fraîche, a drizzle of olive oil, and a sprinkling of parsley leaves. Become intrigued by the idea of crème fraîche. 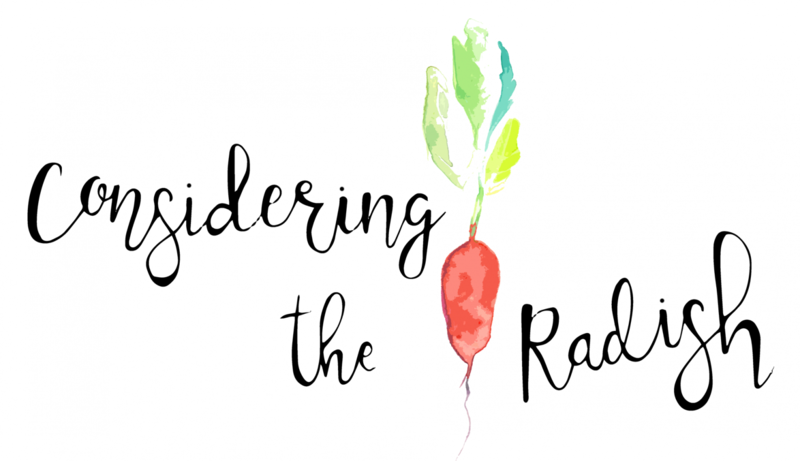 Hear swooning testimonies about its flavor and silkiness from food writers you trust. Go to the store to try it yourself. See that it’s six dollars for an eight ounce tub. Pass on buying it. On a day that you’re feeling particularly extravagant buy the crème fraîche. Try not to think too hard about how you buy expensive groceries when you feel flush. Fall in love with crème fraîche’s smooth, slightly sour taste. Start to put it on everything. Mourn it when you finish the last of the carton. Resist the urge to replace it with more crème fraîche, because it’s six freaking dollars for eight ounces. Cave and buy crème fraîche again. And again. And again. Start to think there must be a better way. Do some research. Try some experiments. Talk with some people who already make it on their own. In a clean jar combine 4 parts heavy cream to 1 part buttermilk. Stir well and cover with cheesecloth. Keep at room temperature for 24 hours, then stir again and refrigerate. Put on everything. Repeat step 4 as necessary. I’m crazy for crème fraîche. Here are some of my favorite uses. -Gilding the lily as a dollop on creamy soups, like the one coming up next. 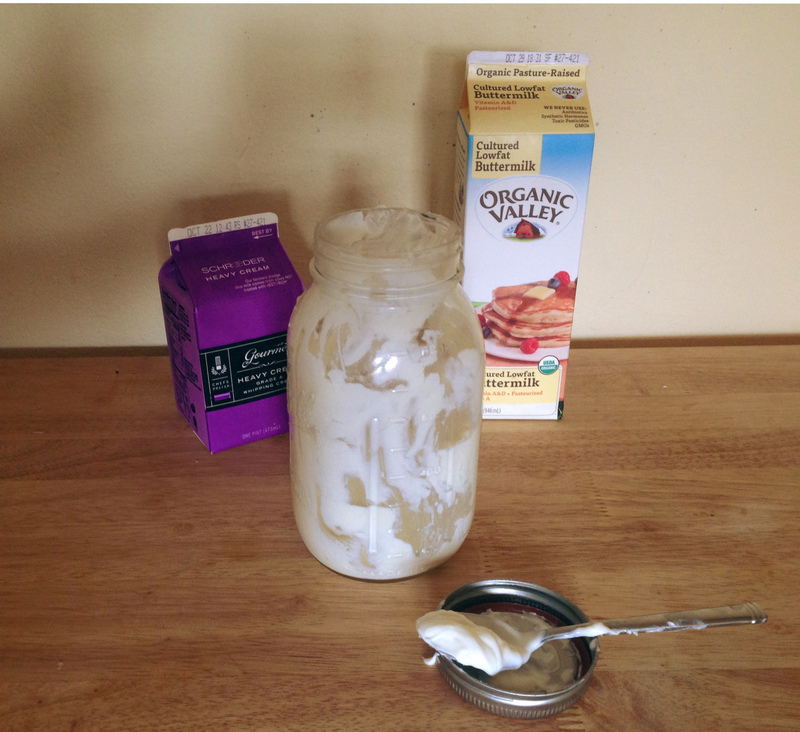 In a clean jar combine heavy cream and buttermilk and mix well. Cover with cheesecloth and leave at room temperature for 24 hours. After 24 hours, stir crème fraîche very well. Cover and refrigerate. The crème fraîche will keep for at least a week (it’s always gone by the time a week is up). They say not to talk about the weather, because the weather is not interesting. Some days I agree. “It’s so hot” is not a compelling story But others I think that rule was invented by people who lived without four distinct seasons. How could someone not find shoots nudging their way through snow covered earth just as the calendar proclaims spring lovely? What beautiful imagery am I forsaking if I swear to never talk about the crunch of newly fallen snow, how it is cold enough that I bundle up in my parka, but that even as my breath freezes in front of me I take off my gloves to feel the tight, freezing dampness of a snowball? And are the leaves that burst into brilliance in the last moments of their lives as we bundle in sweaters and boots really to be ignored? All of this is to say that Fall, after a few false starts, is finally here. I can wear long sleeves without worrying about being overheated. Our air conditioning unit is finally leaving the window. It’s cold in the evenings, cool on the edges, and warmish during the day. It’s the perfect weather for bonfires with blankets, stargazing while lying on car hoods, dinner parties, braises, and the last of the tomatoes. Around here it feels like the most wonderful time of the year. I drink hot tea in the mornings more or less throughout the year, and once the weather starts to cool off I like to add some more hot beverages in my bag of tricks. I’m not sure how you feel about caffeine, but I’m fairly sensitive. Once in the morning is good enough for me, maybe a pick me up in the early afternoon if it’s been a rough day. Any more than that and I get jittery. Unfortunately most warm caffeine-free beverages are full of sugar. And since I’m around sugar all day for my job, I try to limit how much I have at home. Thankfully, I stumbled across this hot chocolate that fit all my requirements (which is not easy) in Anna Jones’ beautiful cookbook A Modern Way to Eat. 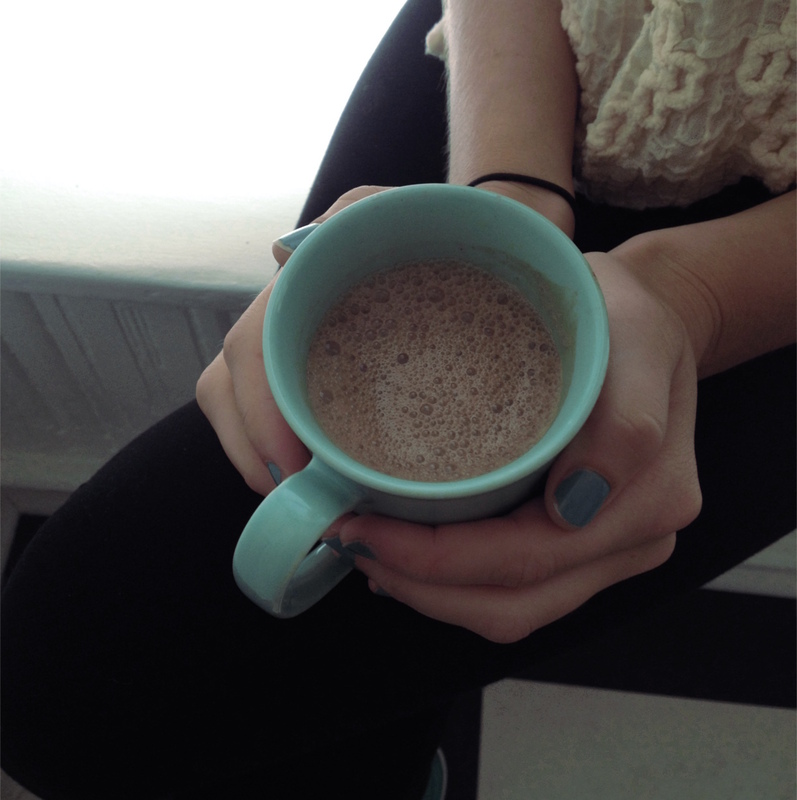 I’m pretty smitten with this hot chocolate. We’re making regular dates. It’s a bit of an unconventional drink, but it’s so much better for that. The milk is warmed and steeped with chamomile tea, which lends it a soft, floral quality. It’s whisked in with cocoa powder, cinnamon, a bit of honey, and just enough salt to make it reminiscent of salted caramel. It truly tastes of chocolate, which is surprisingly hard to find in hot chocolate. It takes five minutes to make, with maybe a minute of active time. And it’s a pleasure to drink- perfect for a fall afternoon. Anna’s original recipe provides an optional addition of 1/2 a teaspoon of maca, which I have never used. If you do try it, please let me know. She calls for your milk of choice, and it’s very good with both almond and cow’s milk. I halved this recipe to make it for one, and made a rough conversion from metric to imperial measurements. If you do use metric, Anna calls for 250 ml of milk per serving. In a small sauce pan warm the milk over medium heat until it just comes to a simmer. Add the chamomile, and let steep for a few minutes. Discard the tea bag, and whisk in the cocoa powder, spices, and honey. Serve warm, preferably with a blanket and book.